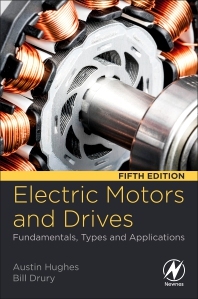 Electric Motors and Drives: Fundamentals, Types and Applications, Fifth Edition is intended for non-specialist users of electric motors and drives, filling the gap between mathematics and theory-based academic textbooks and more prosaic 'handbooks' which provide useful detail, but little opportunity for the development of true insights and understanding. The book explores all of the widely-used modern types of motor and drives, including conventional and brushless D.C. and induction motors and servo drives, providing readers with the knowledge to select the right technology for a given job. This new edition includes additional diagrams and worked examples throughout. New topics include digital interfacing and control of drives, direct torque control of induction motors, and current-fed operation in DC drives. The material on brushless servomotors has also been expanded. Bill Drury is an independent consultant in power electronics, electrical machines and drives (PEMD). He has 45 years industrial PEMD experience - Siemens, Rolls-Royce and for 20 years Technical Director of Control Techniques. He is a Chartered Engineer and a Fellow of the Institution of Engineering and Technology (IET). He is a Visiting Professor of Innovation at Bristol University and a Visiting Professor at Newcastle University.